I want to welcome you to take part in our Field School which celebrates its 27th Field Season in 2016. I’m sure you’ll have an interesting time, especially if you’re interested in human evolution and our hominin ancestors. It is not too late to sign up. There is no application form: just send an email to mjwalke@gmail.com and you MUST attach a 1-page (brief) c.v. which MUST include (1) your full name, (2) date of birth, (3) nationality and passport number, (4) permanent home address, (5) address for correspondence, (6) contact phone number(s) and email address(es). If that information is not sent, you probably will not get a reply from us. You may very well be as lucky as some recent participants who have helped to excavate hominin bones and teeth during the course of their stay with us. The most recently found are Neanderthal bones, still in their original state of anatomical articulation of the chest, shoulder girdle and upper limb, and of the pelvic girdle, leg and foot, which belong to maybe three individuals, perhaps crushed by a rock-fall or perhaps intentionally arranged and covered with rocks, which we have been uncovering at Sima de las Palomas since 2005 and which date to between 55,000 and 40,000 years ago. Some of them our helpers it was the most exciting thing they had ever done. Several of them knew very little about human evolution or how we excavate at prehistoric sites when they arrived, and went away thrilled and having picked up a great deal of both knowledge, not to mention Neanderthal human remains! There is also great excitement at Cueva Negra which lately has been recognized as a very much older site than we had thought it was. In its sedimentary fill we have recovered numerous teeth of fossil rodent species known from several sites in Spain after 1,000,000 years ago that became completely extinct long before 500,000 years ago. We have also excavated an Acheulian hand-axe associated with flakes struck by the so-called Levallois technique and stone tools with abrupt Mousterian-like retouch. Palaeomagnetic research undertaken by the Berkeley Geochronology Center shows that the sedimentary fill is older than 780,000 years ago. Palaeontological and palaeopalynological research suggest an age of 800-900,000 years ago. In 2011 we began to find calcined animal bones and burnt chert 4.5 metres down in the sediment, which give us the oldest evidence for fire in Europe found to date (in Africa there is evidence from before 1,000,000 years ago). The 2012, 2013, 2014 and 2015 field seasons have found more evidence still of this astounding discovery. If you go to http://www.mupantquat.com you will find, and should open, study, and save, a long document entitled BRIEFING YOU which tells you how the Project got started and where we’re at right now. As you’ll see, since the Project began in the early 1990’s we have found a large number of remains of hominin and animal bones, and the stone tools of Pleistocene hominins. I hope the updated version of BRIEFING YOU will be on our mupantquat web-site during January 2016 but until then 2015 version will be left on it and the information, except for the dates, is fundamentally what the 2016 version will include. 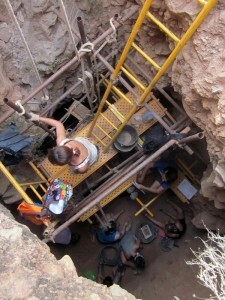 The Project is carrying out excavations at two sites in Murcia province, S.E. Spain which date from between 900,000 and 40,000 years ago, and are called: Cueva Negra (Black Cave) del Estrecho del Río Quípar de La Encarnación, and Sima de las Palomas (Dove Hole) del Cabezo Gordo de Dolores de Pacheco. The dates when we shall be at each site are as follows: SESSION 1: June 30th (Thurs.) – July 21st (Thurs.) 2016 at Cueva Negra del Estrecho del Río Quípar SESSION 2: July 21st (Thurs.) – August 11th (Thurs.) 2016 at Sima de las Palomas del Cabezo Gordo. We start and finish on Thursdays because from London there are both Ryanair flights (from Luton and Stansted) and Easyjet (from Gatwick) on weekdays – as well as many other low budget flights by other airlines (see FIELD LOGISTICS), and also connecting Iberia-Air Nostrum flights from Madrid and Barcelona on weekdays -but not at weekends -for intercontinental travellers arriving in Spain (e.g. from U.S.A.). I think the best thing you can do now is to find and read BRIEFING YOU very carefully, and then make up your mind. If you have any queries, please don’t hesitate to write to me. Very important! If you are coming, please send me, as soon as you can, details about your route, place, date, and time of arrival so that we know you are definitely arriving so as to put you on our list of people to be picked up at Murcia-San Javier Airport (or at Calasparra railway station for Cueva Negra) – or else so that we know you are NOT to going to be picked up by us if you are coming under your own steam or on other days. This is very important for you and for me! The president of the “Asociación Murciana para el Estudio de la Paleoantropología y el Cuaternario “ (MUPANTQUAT) and codirector of the archaeological excavations in “Cueva Negra del Estrecho del Rio Quipar” and “Sima de las Palomas del Cabezo Gordo”, Michael J. Walker, was invited to give some lectures during last June 2014 in different universities like Bristol, Reading, York and in the Archaeology Institutes of the University Colleges of London and Oxford. Last June the 5th, professor Walker visited the Peel Lecture Theatre, Bristol University, as “Benjamin Meaker Visiting Professor”. 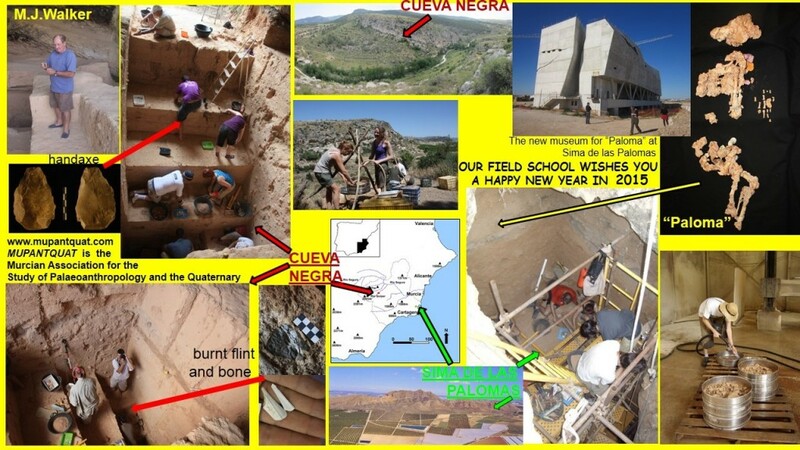 The lecture was titled: “Archaeological excavations at Sima de las Palomas del Cabezo Gordo (Murcia, SE Spain) and palaeoanthropological research into its 50,000-year-old Neanderthal remains”. It atracted interest of about one hundred assistants, including Kate Robson-Brown, Professor of Biological Anthropology, her research team and many of her students, Dr. Jonathan Musgrave, paleoanthropologist and expert in neanderthal anatomy, Dr. Andrés López Bernal, born in Murcia and Professor of Human Reproductive Biology, and Gonzalo Linares Matas, member of our Mupantquat association who’s been studying archaeology in the university of Exeter and future student in Oxford University. It is worth mentioning that our visit to Bristol University also had the aim to reinforce the collaboration with the professor of Archaeology Kate Robson-Brown who, in March 2012, stayed in Murcia University, doing microtomography scans of some teeth and small size bones from Sima de las Palomas. The 4th of June, Michael J. Walker, gave a seminar in her department about “Cognitive evolution in Pleistocene Homo: Biological and palaeoanthropological perspectives on the role of “haptic” working memory in the evolution of long-term procedural memory”. The talk in the Department of Archaeology of the University of Reading took place the 9th of June thanks to the invitation of Dr. Rob Hosfield, expert in paleolithic. 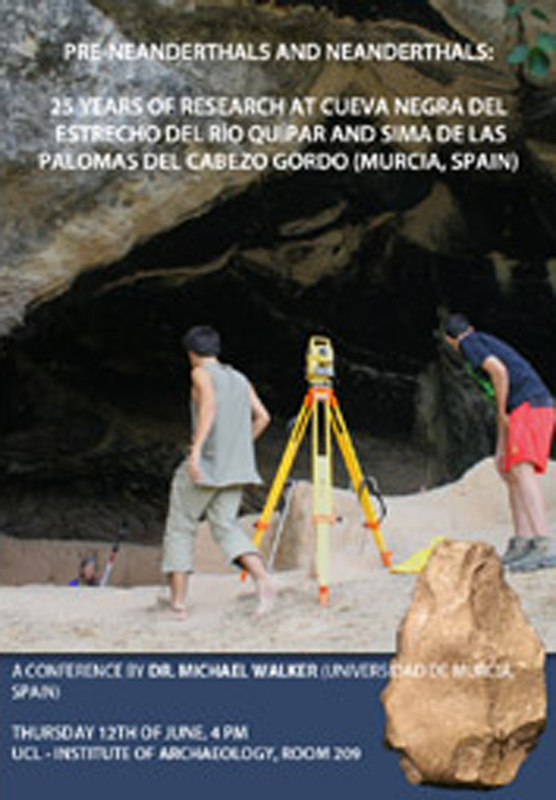 To the conference, titled “The Sima de las Palomas and the Cueva Negra”, assisted, among others, close collaborators of our reasearch team as Mr. John Simpson, O.B. E., which is archaeolgist by this universty, and Mr. Ian Herbertson, nowadays doing a phd directed by dr. Hosfield. It also assisted D. Sturart Black which showed interest in collaborating with our research. The 11th of June, he gave a conference entitled ”The Sima de las Palomas and the Cueva Negra” in the archaeology department of the university of York, invited by Dr. Penny Spikins, who has recently published and article about neanderthal’s childhood in the Oxford Journal of Archaeology. Professor Walker had the chance to visit the Department of Bioarchaeology and the Anatomy Department in the Medicine Faculty, besides meeting with different professors like the paleolithic specialist Geoff Baile, the bioarchaeologist Mathew Collins, specialist in organic deposits who directed the phd thesis of our scientific partner, Dr. Cynthiane Spiteri from the Max Planck institute for Evolutionary Anthropolgy in Leipzig, and proffesor Paul O’Higgins which is a great authority in the investigation and virtual reconstruction of fossil skulls from humans and primates. 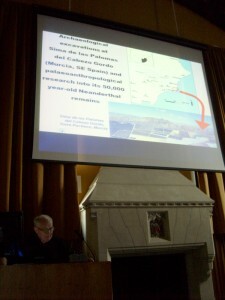 The 12th of June he gave a conference titled “The Sima de las Palomas and the Cueva Negra” in the institute of Archaeology of the University College London, invited by Dr. Norah Moloney, paleolithic expert that has visited our sites. 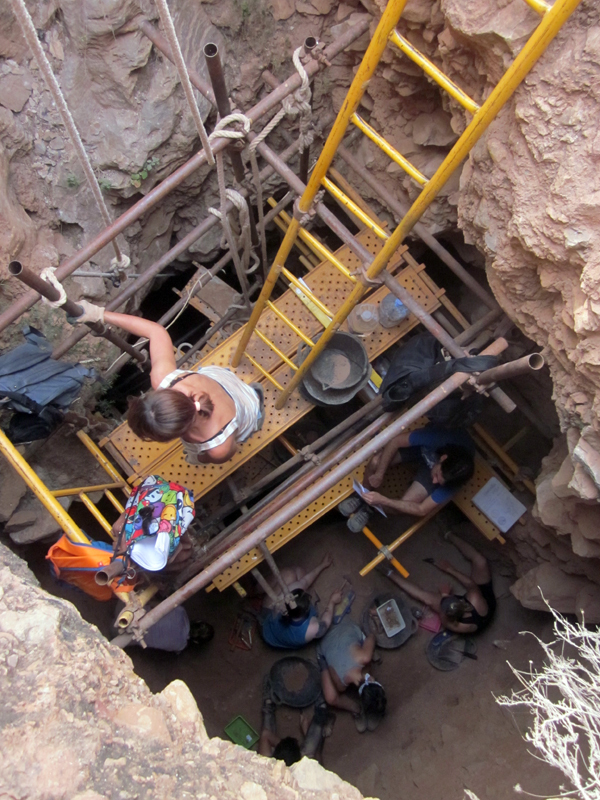 Among the assistants there were Maddy Bleasdale and Megan Wright, both students from UCL that last year were part of the excavation team in Sima de las Palomas. 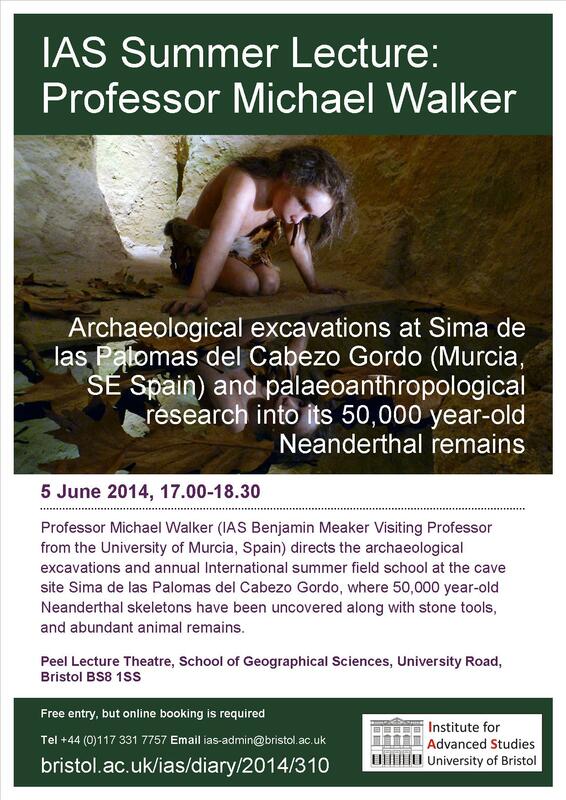 Finnaly, the 19th of June, professor Walker repeated the conference titled “The Sima de las Palomas and the Cueva Negra” in the Institute of Archaeology, Oxford University, invited by the paleolithic specialist and professor Dr. Nick Barton. 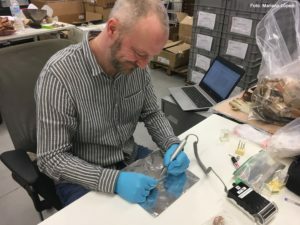 Between the assistants there were professors like the geoarchaeologist Dr. Tom Higham and the paleolithic specialist Dr. Derek Roe, an other scholars like the paleolithic specialists Michael Petraglia and Richard Roberts and the geoarchaeologist Jean-Luc Schwenninger. Drs. Roe, Higham and Schwenninger are scientific collaborators of our reasearch team, after the conference they had time to discuss the advance of the investigation and future goals in it. To the oxford conference it also assisted phd students like Klint Janulis, who was part of the excavation team in 2012 and will be visiting us during 2014 summer, and Marco Antonio Bernal Gómez who met professor walker during a lecture in the University of Cadiz in Jerez. There was time aswell to chat during a couple of hours with Claire Litt, Oxbow Books editor, in relation with the english version of the popular science book about Cueva Negra and Sima de las Palomas that Oxbow books will publish.